The Turkish nationalist movement headed by Mustafa Kemal, with headquarters in Ankara, did not recognize the Treaty of Sevres signed by the legal government of the Ottoman Empire on August 10, 1920. Barely a month later, on September 23, Turkish armed forces under the command of General Kiazim Karabekir started an attack, without mediating a war declaration, against the Republic of Armenia. A month later, again, the fortress of Kars—the most important bulwark of the Southern Caucasus—would fall almost without a fight to the advancing troops. Kars, the capital of an Armenian medieval kingdom ruled by a branch of the Bagratuni family, had changed hands several times over the past hundred years. After being briefly occupied by Russian troops in 1855 during the Crimea War of 1854-1856, it was occupied again during the Russian-Turkish war of 1877 and annexed to the Russian Empire as a result of the Treaty of Berlin in 1878. It fell to the advancing Turkish troops in March 1918 and was re-conquered by the troops of the newly born Republic of Armenia after the Turkish retreat following the end of World War I. The young commander of the fortress, Col. Mazmanian, gave the order of attack to his soldiers, who refused to follow his orders and, instead, deserted. Confronted with the shameful desertion, Mazmanian took his own life with his revolver in the sight of his soldiers. According to the memoirs of Karabekir and other sources, the Kemalist soldiers and the Turkish, Kurdish, Muslim, and Armenian Bolshevik rebels occupied the entire city in three hours, took hundreds of Armenian officers and soldiers as prisoners, seized an enormous quantity of war material (cannons, projectiles, weapons, and bullets) and massacred thousands of people among the civil population; in 1920-1921, the Turks would kill a total of 20,000 Armenians in the city and the province of Kars. Years later, Garegin Nejdeh, who headed the successful defense of Zangezur against the attacks of Azerbaijanis and Bolsheviks from 1919-1921, would write: “The shame of Kars is not only of the government of the Republic of Armenia, but of the entire Armenian people. The armies measure their forces and clash, but the nations are the winners or the losers. Under the walls of Kars, not only the Armenian soldier and the general were defeated, but also the entire Armenian people, lacking spirit of fight and bravery." The effects of the fall of Kars would be catastrophic. Despite Armenian heroic resistance in other places, two weeks later, Alexandropol (now Gumri) fell to the Turks, which practically reached the outskirts of Yerevan from the west. The cabinet of Prime Minister Hamo Ohanjanian fell, and Simon Vratzian became Prime Minister of a coalition cabinet, which lasted scarcely a week. On November 29, 1920, Bolshevik forces entered Armenia from the east, and the Armenian government, confronting the menace of destruction, chose the lesser of two evils and power was transferred to the Communists on December 2. Armenia would enter the Soviet Union in 1922 as part of the Federative Republic of Transcaucasia. The trauma of the fall was masterfully addressed by poet Yeghishe Charents, a native of Kars, in his only novel, Yerkir Nayiri (Land of Nayiri), published in 1926. The fall of Kars still remains a polemical one in the historiography of the Republic of Armenia. 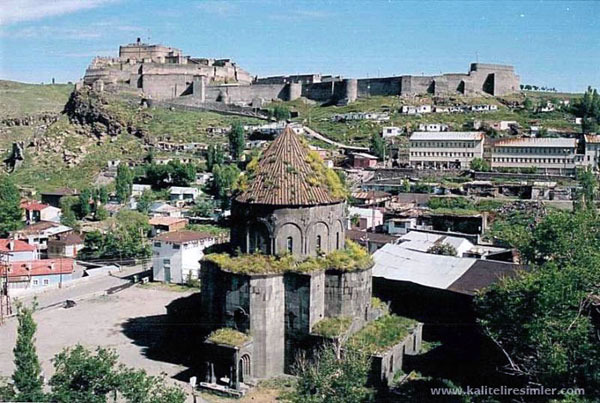 A general view of modern Kars with the central Armenian church in the foreground and the fortress in the background.